Greetings and salutations…and welcome to another addition of “Monday morning check in” (I have no clue what that was…I guess I am just in a goofy mood this morning). How appropriate that we get a text that talks about paying taxes. In a time of economic hardship the last thing people want to hear about is paying taxes. Here in Jackson, taxes are a huge issue. There is a battle currently waging about the proposed construction or renovation of the county Resource Center. Some want to see a brand new building and others want the current one (the old high school) renovated. Either way, taxes would go up quite a bit in Jackson. And this is after the new school referendum passed last year that some people believe the district is misusing. What a time we live in. At race time (8am) the temperature was 48 degrees with over cast skies that threatened to rain on us. As I Stood on the street next to the HHH Metrodome, waiting to begin, I found the 5 hour pace team leader, Lori. Lori’s Job was to help us cross the finish line in under 5 hours. Most of the people in this group were first time marathoners with the exception of a couple who were running their 2nd. The strategy laid out for us was that we were going to run for 5 minutes and then walk for 1 minute through the whole race. At first I was a little annoyed with the walking part and considered leaving this group, but I didn’t…and I am glad I stuck with Lori and the team. Those 1 minutes walks were a great way to conserve energy. The gun sounded, 11,000 people cheered and we were off. For the first couple miles I never gave a second thought to the fact that I would be running for 5 hours. I just took in the whole experience: The mass of people running, the crowds cheering along the way, and the beautiful scenery. At about mile 2 (the Walker Art Center) the over cast skies followed through with their threat and it started to drizzle, but that wasn’t so bad…I’ve run in drizzle before. At around mile 3 to 4 the drizzle became a steady rain and got heavier. We rain in a semi-hard rain until around mile 8 to 9 then it started to let up. By the half way point the drizzle was gone but it was still chilly as the wind blow off the lakes. Back at mile 17 Lori warned us to make sure we carb up for the mile 20 hills. So when we approached the aid station at mile 17 we took our gel/energy packs. I ate a protein bar and took in some fluids. I was ready for the hills. But at 20 1/2 miles the very thing I feared the most happened…muscles in both legs started to cramp up. I remember pleading with God, “Please God, not now…I am less than 6 miles away”. So I pushed through the pain. But just before mile 22 the pain became more than I could handle so I had to let my pace team go and say good bye to my 5 hour goal. Psychologically I was devastated and felt like giving up. But then a voice in my head (God of course) kept saying “13 months…13 months”…that is how long I had been training for this marathon. I decided then and there I was not going to let some annoying leg cramps stop me. After a little walking the cramps went away so I started running again, but after a minute or so the cramps came back so I was forced to walk. And this was the routine for the rest of the marathon…4 miles worth. At mile 24 I got an emotional boost when I heard someone call my name out…it was Connie’s sister and brother with our 2 1/2 year old nephew. Their presence and support meant so much to me. At mile 25 I knew I was almost there and I knew that I was actually going to do this. When I crossed the mile 26 marker (with 0.2 miles to go) I could see the finish line…and it was all down hill (thank God). 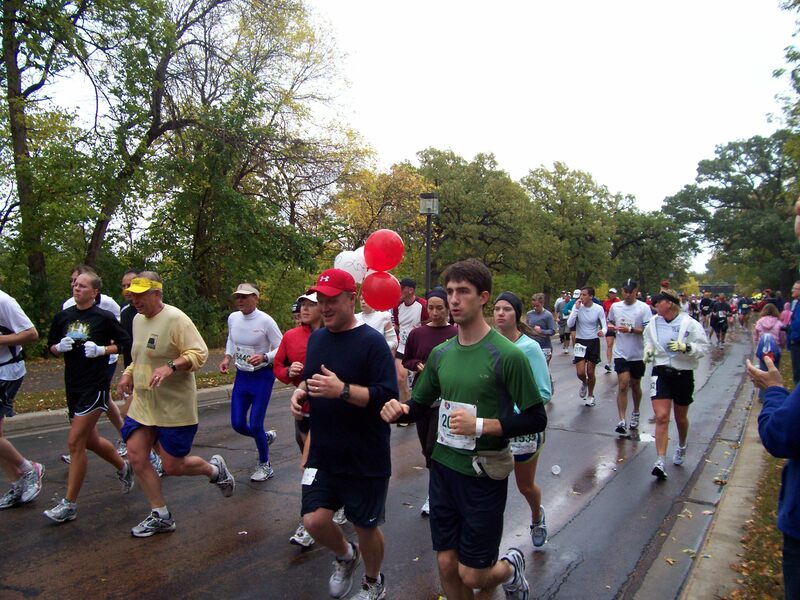 The street was lined with cheering people and I started running. My cramps weren’t gone yet but I decided that I was not going to walk across the finish line. I started running and I was going to finish running. So through the intense pain I keep my eyes fixed on the finish line banner listening to the announcers call out every name that crossed the finished line. At this moment I became overwhelmed with emotions and tears started streaming down my face. And…as I crossed that finish line…and heard my name…I completely lost it. I actually finished . For a few moments the pain in my legs did not matter…I made it…26.2 miles…5 hours and 2 minutes (and 28 seconds)…through the rain and wind and lots of pain…I made it. I clung to my finishers medal as if someone was trying to steal it. I made it…and no one can take that away from me. I feel such a sense of accomplishment and it is that I can not adequately put into words. But before I finish this post (and please excuse me for going on so long) I need to give a HUGE thank you to my family…Connie, my mom and my sister…who ran around town, dodging closed roads to cheer for me at 4 points along the route. They stood in the rain and showed their love and support…THANK YOU. And thank you to everyone out there that gave me well wishes and were praying for me. Knowing that there were so many people praying was also a huge boost for me. Thank you to friends (like Brad) who gave me words of encouragement and advice through this blog and Facebook. Thank you to anyone else I am missing. And of course…I need to thank God, for God alone gave me the energy and strength to complete this marathon. THANK YOU GOD…TO YOU BE THE GLORY! Now…what’s next? Will I run another marathon? Well…right now my legs are very stiff and sore so I am not thinking about that right now. I know that my running is not done, but I am just not sure what future races I will enter. Part of me wants to tackle those mile 20 hills again and try to finish in under 5 hours next year, but first things first…I need to heal and recover then I will set some more goals. Thank you for putting up with all my marathon talk these past 13 months but I got a feeling it is not going to end. Being a pastor…I encountered so my sermon illustrations yesterday that they are bound to show up here sometime in the future. With that…I am going to get up and loosen my legs up a bit and find a couple ice packs. Take care and God bless. 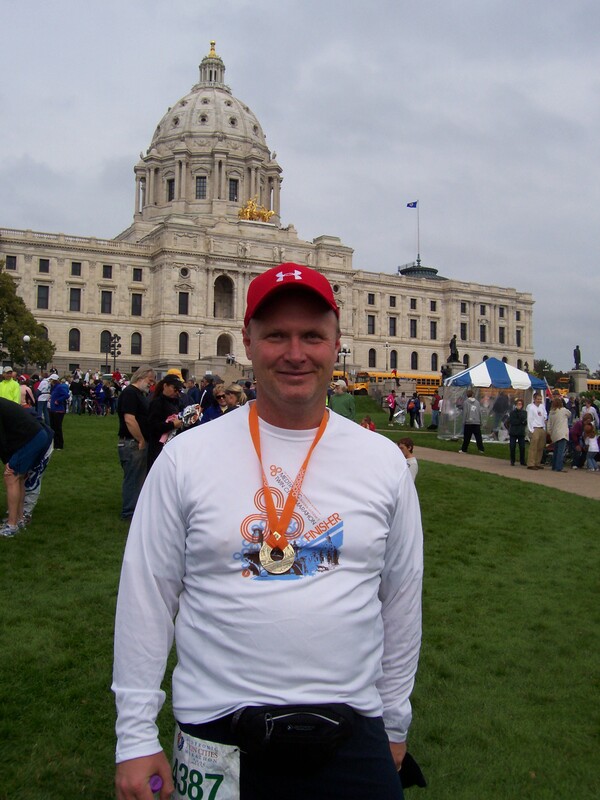 I finished the Twin Cities marathon in 5 hours and 2 minutes. What a relief. …this time tomorrow (Sunday, 8am) I will be being my 26.2 mile quest. It’s hard to believe it is almost here, but first things first…tonight I get to go to the Olive Garden. Whoo hoo!